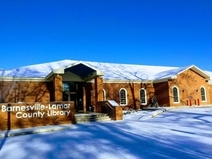 See what surprises the Barnesville-Lamar County Library has for your family! Check out a FREE Family Pass for up to 4 visitors at the Go Fish Education Center in Perry, GA. Explore Georgia's underwater habitats from streams to swamps. See live fish and alligators. Test your skills on fishing and hunting simulators. Hike the nature trail. Visit the hatchery, and catch a fish in the outdoor pond. Open Fri & Sat 9-5; Sun 1-5. Zoo Atlanta wants Georgia PINES members to go to the zoo for FREE! Please check the Zoo Atlanta link for details. We encourage you to watch the video at the library or return it the next day so more families can take advantage of this great resource. It's a good idea call ahead to see if it is in. With the Georgia State Park, Recreation, and Historic Sites Family Pass. The pass, which is for free entrance and parking, can be checked out for one week. Click the link for a complete listing of all locations with descriptions, hours of operation, and events. Come by the Library and check out the Center for Puppetry Arts passport. It's good for free museum admission for four or 25% off an all-inclusive ticket which includes a family series performance, a create-a-puppet workshop, and the museum! Please call the center at least 48 hours in advance before using the voucher. For further details, check their website. Through the Family Pass loan program families can now visit the museum for free. Individuals with a valid library card can now check out the Family pass to the Carlos museum for six people.